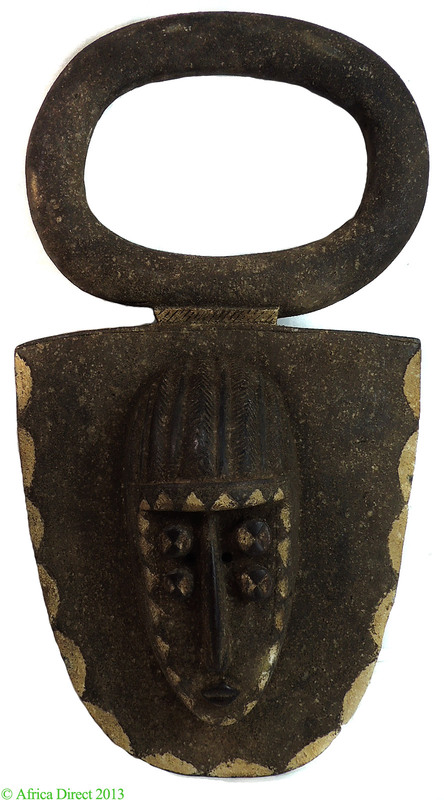 Dimensions 31 Inches H. x 17 inches W.
Additional Information: An interesting example of one of the largest of all African mask type with a well carved human face with four eyes. 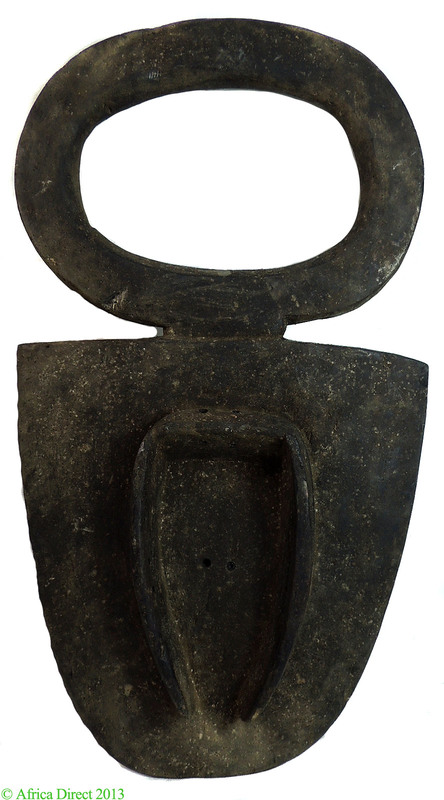 The Bedu Nafana style can be recognized by the larger circular appendade on the top and the triangular form within which the face is inserted. This mask could be from the Kulango people. The tradition of Bedu masks is also found among the Kulango. The Nafana are a Gur-speaking people who are considered part the Gurunsi group. Though they are a small culture, less than 50,000, they are widely scattered, with the bulk of their population found in Burkina Faso. Their arts show a strong link to the Burkina traditions of opposing colors and geometric patterns. Primarily hunters and fishermen, they are well-known for their huge and splendidly decorated vertical plank masks such as this one. They sometimes exceed 6 feet in height and are known as "Bedu". Bedu masks were danced in different ceremonies including during the purification ceremonies to rid the village of evil and to celebrate life. They were also danced during the annual ceremonies after the yam harvest (zaurau) and at funeral rites. During the masquerade Bedu masks usually appear in male and female pairs.Our example may represent a female because of its elaborate superstructure. The artistry of the "Bedu" masks represents one of the pinnacles of West African art, and they are eagerly sought after by collectors and decorators for their size and colorful, abstract appeal.Our example is nicely decorated and would be of good addition in any collection. ART OF AFRICA, by Kerchache, et al.